Because nothing goes better with good beer than good food. Our original location on Aztec Street offers a full menu of soups, salads and sandwiches. Locally-made Papa Jefe’s killer salsa. Mighty, mighty spicy! Black bean chili, corn chips, cheese and diced onion. A classic! Sandwiches are served with kettle chips and a pickle. . .just cuz! Ask for the Sandwich O’ Da Day: a snazzy combo of whatever we have on hand! Sourdough bread and cheddar cheese. Simple, gooey and delicious! House-made Brewhouse Root Beer & vanilla bean ice cream! The Canteen Taproom at 417 Tramway features local brats, savory flatbreads, and a variety of sandwiches and salads. Tortilla Chips and Albuquerque’s own Papa Jefe salsa. Careful. . . it bites back! Assorted artisanal meats and cheeses served with pickled vegetables. Our house-made beer fondue served with warm salted pretzel bites. Served with mixed organic greens, cucumber, radish and cherry tomatoes. Served with shaved Gruyere, salted pumpkin seeds, cherry tomatoes and all-natural bacon. Served with organic mixed greens, kale, turkey, roast beef, Swiss and cheddar cheese. Flatbread served with San Marzano tomato sauce, burrata, pear tomatoes, extra virgin olive oil and basil. Flatbread served with whipped sea salt ricotta, caramelized onions, serrano ham and arugula. 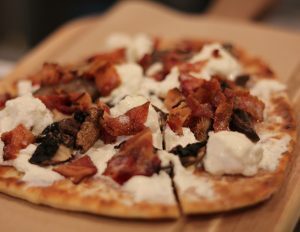 Flatbread served with roasted mushrooms, goat cheese, sea-salt ricotta and bacon. Turn up the heat with a green chile chicken sausage! Try it with our Dougie-Style Amber! A pork sausage with garlic, paprika, onions and other spices. Try it with our HIgh Plains Pilsner or our Flashback IPA! A mild German pork sausage. Delicious! Try it with our Pecos Trail Brown! Your choice of artisanal sauerkraut: Garlic and dill, Sriracha or craft beer. Sandwich served with porchetta, Gruyere cheese, and arugula. Served on a garlic and rosemary bun. Sandwich served with cold roast beef, arugula, cheddar cheese, and balsamic mayo. Served on a ciabatta bun. 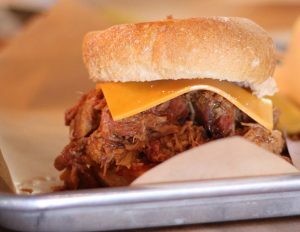 Sandwich served with Sous Vide pork shoulder, Carolina-style mustard BBQ sauce. Served on ciabatta bun. Sandwich served with New York deli-style smoked brisket, Swiss cheese and balsamic mayo. Served on a ciabatta bun. Sandwich served with grilled portabellini mushrooms, aged cheddar, caramelized onions, roasted red peppers and balsamic mayo. Served on a garlic and rosemary bun. Sandwich served with organic heirloom tomatoes, burrata, all natural bacon and arugula. Served on a garlic and rosemary bun. Sandwich served with all natural turkey breast, all natural bacon, provolone and organic mixed greens. Served on a ciabatta bun.